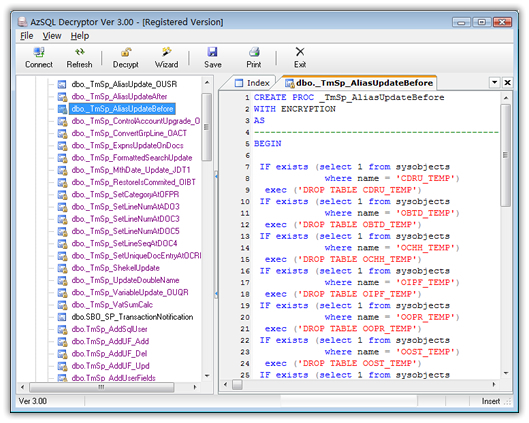 AzSQL Decryptor is a powerful SQL object decryptor. It allows you unravel a single encrypted sql object or an entire database full of stored procedures, triggers, views and user defined functions with simplicity and blinding speed. Its user-friendly interface allows for easy viewing of encrypted code of any size and complete SQL Script quickly and exactly. Full supports SQL2000-2008, Our decryptor is very suitable for database programmer & DBA. * AzSQL Decryptor work with Microsoft SQL Server 2000, 2005, 2008 and Microsoft? Database Engine (MSDE). * AzSQL Decryptor support Windows 2000, Windows XP, Windows Server 2000 and Windows Vista. CHAOS Self Decryptor creating self-decrypting archives (SDAs). Qweas is providing links to AzSQL Decryptor 4.20 as a courtesy, and makes no representations regarding AzSQL Decryptor or any other applications or any information related thereto. Any questions, complaints or claims regarding this application AzSQL Decryptor 4.20 must be directed to the appropriate software vendor. You may click the publisher link of AzSQL Decryptor on the top of this page to get more details about the vendor.